The senator’s question was simple and straightforward: What would you have done? Judge Neil Gorsuch wouldn’t answer. He couldn’t say whether, on orders from an employer, he’d have driven a tractor trailer with locked brakes, endangering the lives of other motorists, or instead allowed himself to freeze to death in sub-zero cold in an unheated truck cab while awaiting a mechanic. The vaunted jurist nominated for a seat on the U.S. Supreme Court couldn’t answer a basic question about a case on which he’d issued an infamous dissenting opinion. The fact that he had never considered the key question and the fact that Gorsuch, born and bred a one-percenter, decided this case and others for moneyed interests without a thought for the people injured as a result, disqualifies him for a seat on the nation’s highest court. Sen. Al Franken was among the lawmakers who asked Gorsuch about the case of Alphonse Maddin during the senate confirmation hearing last week. Maddin, 48, of Detroit, was driving a truck loaded with meat on Interstate 88 across rural Illinois on a night in January 2009 when the temperature was a life-threatening minus 27 degrees. Maddin pulled over to figure out how to get to a corporate-approved gas station. When he tried to pull back onto the road, the brakes on the 50-foot trailer had frozen, though not those on the cab. He radioed his employer, TransAm Trucking Inc., at 11:17 p.m. for road service and was told a repairman would arrive within an hour. The engine in the cab would not idle and the heater would not work. Maddin bundled himself in a blanket in the bunk area and fell asleep. When a phone call from a cousin awoke him two hours later, the temperature gauge inside the cab registered minus 14 degrees. He was numb, blue with cold and his skin was burning and cracking. He couldn’t feel his feet and could barely stand. The cousin testified later that Maddin’s speech was slurred and he seemed confused – symptoms of hypothermia. Maddin called TransAm again to find out the status of the repair truck. He informed the dispatcher of the perilous temperature. The dispatcher told him to wait. He remained in the cab for another half hour, but by then he was having trouble breathing and feared for his life. He called his supervisor, who ordered him to either drive dangerously dragging the frozen-braked trailer or remain waiting in the mortally cold cab. Maddin unhitched the cab from the trailer and drove to a gas station. He returned less than a half hour later to find the mechanic at the trailer. When the brakes were repaired, Maddin completed the delivery. Then TransAm fired him for leaving the trailer unattended. Maddin appealed. 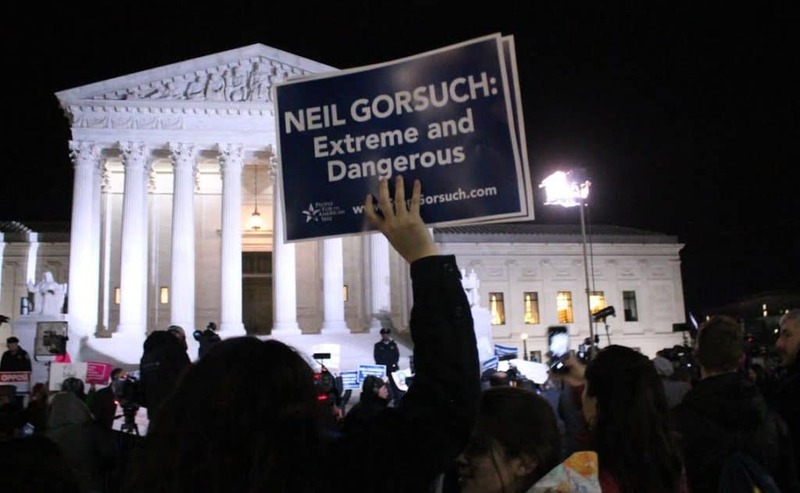 By the time the case got to the U.S. Court of Appeals for the 10th Circuit in Denver, to which Gorsuch had been appointed in 2006, four judges already had decided in Maddin’s favor. At the 10th Circuit, a split three-judge panel also ruled for Maddin, with only Gorsuch defending the firing. “In my heart of hearts, I felt like he willfully tried to negate the human element of my case,” Maddin, who has since earned bachelor’s and master’s degrees, told the Guardian newspaper. Gorsuch doesn’t characterize it as a life-threatening option. He calls it “unpleasant,” as if it had been nothing more than enduring the stench of a cow pasture. Gorsuch’s dissent says it was perfectly fine for TransAm to fire Maddin for acting to save his own life. Under Gorsuch’s reasoning, a corporation is entitled to require a worker to die for a load of meat. At the confirmation hearing, Sen. Franken tried to get Gorsuch to put himself in Maddin’s place. The senator asked the judge, who at 49 is only a year older than Maddin, what option he’d have taken, driving the unsafe trailer or freezing to death. Despite the down-homey show Gorsuch put on, there is no way this one-percenter could imagine himself in a trucker’s shoes. Gorsuch has treated other vulnerable people the same way. In the case of Grace Hwang, a lawyer and college professor who suffered breast cancer then leukemia, Gorsuch again sided with an employer who fired a worker faced with untenable choices. When Hwang recovered and prepared to return to teaching at Kansas State University at the end of a six-month leave, her doctors advised her to wait because her immune system was compromised and flu was epidemic on campus. The university refused her request for more time. In the opinion he wrote, Gorsuch justified her firing, saying that federal law is not intended “to turn employers into safety net providers for those who cannot work.” In an article in the San Francisco Chronicle, her children, David and Katherine Hwang, aptly described Gorsuch’s decision as heartless. “It removed the human element from the equation. It did not bring justice,” they said. Autistic children like Endrew F. got no better treatment from Gorsuch. In the case of such a child, Gorsuch wrote that it was fine for a school district to provide instruction to special-needs children that resulted in improvement that was “merely. . . more than de minimis,” in other words, advancement so trivial as to be barely measurable. Virtually no educational progress is fine for autistic children, in whose shoes Gorsuch could never imagine walking. To Gorsuch, Alphonse Maddin is not a man, but a “trucker.” In Gorsuch’s world, an autistic child is not a human deserving an education. In his mind, a college professor relinquishes personhood when she falls ill. Gorsuch’s perverse propensity to discount humanity makes him unfit for the court. A soulless man cannot serve justice.